Fees compound over time, just like investment returns. But rather than push the value of portfolios higher over the long run, fees do the exact opposite. They eat away at the value of your portfolio. John Bogle, the founder and former CEO of Vanguard, referred to this as “the tyranny of compounding costs.” In some cases, the effect of costs can be so oppressive, that you may lose more than half of your investment to fees over your lifetime. Each year, the client’s portfolio increases by the amount of her portfolio’s appreciation less the total fees charged. In effect, the fees shrink the value of the portfolio that is available for compounding over future years. The portfolio experiences this shrinkage every year the client is invested, which can be a considerable period of time. To isolate the impact of fees we assume: (1) the client makes no additional contributions/withdrawals over time; and, (2) the asset allocation remains fixed at 60% equities and 40% bonds. We then compute the fraction of the client’s wealth that will be lost to the combined effect of productfees (i.e. the expense ratios of the funds used to construct the portfolio) and advisory fees (the fees charged by the advisor to manage the overall portfolio), as a function of the number of years over which the client invests. Table 1: Asset-weighted average expense ratio for active and passive mutual funds (ICI Fact Book 2016, p. 97). 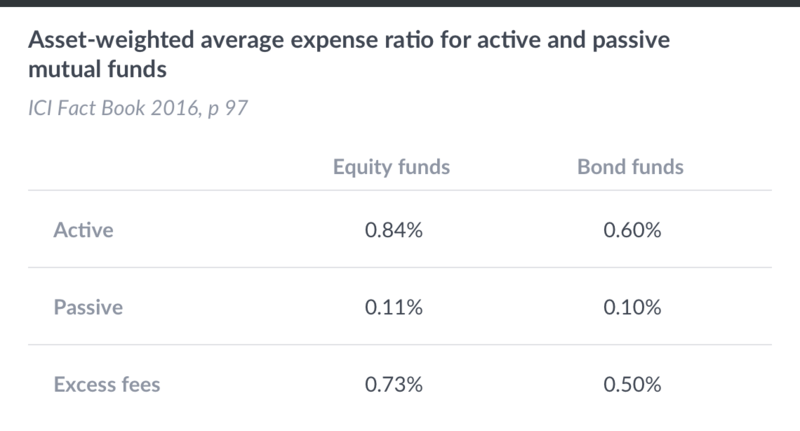 Investors in passive funds incur modest expense ratios on the order of 10 basis points per year (0.10%). By contrast, those in active equity mutual funds incur fees that are 73 basis points higher per year; and those in active bond funds — 50 basis points higher per year. A passive investor with a 60% equities / 40% bonds allocation therefore pays just under 11 basis points, whereas the investor using active funds would pay roughly 74 basis points per year. Finally, our example assumes that product fees in each category will continue their decline, and will be halved over the next 60 years. These professionals can provide many benefits to investors, such as helping them identify financial goals, analyzing an existing financial portfolio, determining an appropriate asset allocation, and (depending on the type of financial professional) providing investment advice or recommendations to help investors achieve their financial goals. The investment professional also may provide ongoing services, such as responding to investors’ inquiries or periodically reviewing and rebalancing their portfolios. The fees charged for these services can be very significant. For example, in its 5th annual report on retail wealth management — covering over seven million investors and $3.5 trillion in assets — PriceMetrix found that the average client paid an annual advisory fee of just over 1% for the services of a financial advisor. These fees ranged from 1.4% for households with assets under $250,000, to roughly 0.8% for households with over $2 million in assets. It is worth emphasizing that many — if not all — of the above services are available from fully automated investment advisors at significantly lower costs. The first iteration of Wealthfront’s investment service, launched in December 2011, offered investors a range of diversified and automatically-rebalanced portfolios of low cost index funds, which were subsequently differentiated between taxable and non-taxable accounts. This was augmented with the launch of Daily Tax-Loss Harvesting in 2012, and Stock-level Tax-Loss Harvesting in 2013 (a service which has yet to be replicated by any industry incumbent). These services are available at a cost of only 25 basis points on all assets over $10,000. As was the case for product fees, we assume that the cost of advisory services will also be halved over the client’s lifetime (60 years). The figure below displays the share of the client’s initial deposit that is lost to fees (product and advisory) as a function of the length of the investment horizon for the two advisory options: traditional and automated. 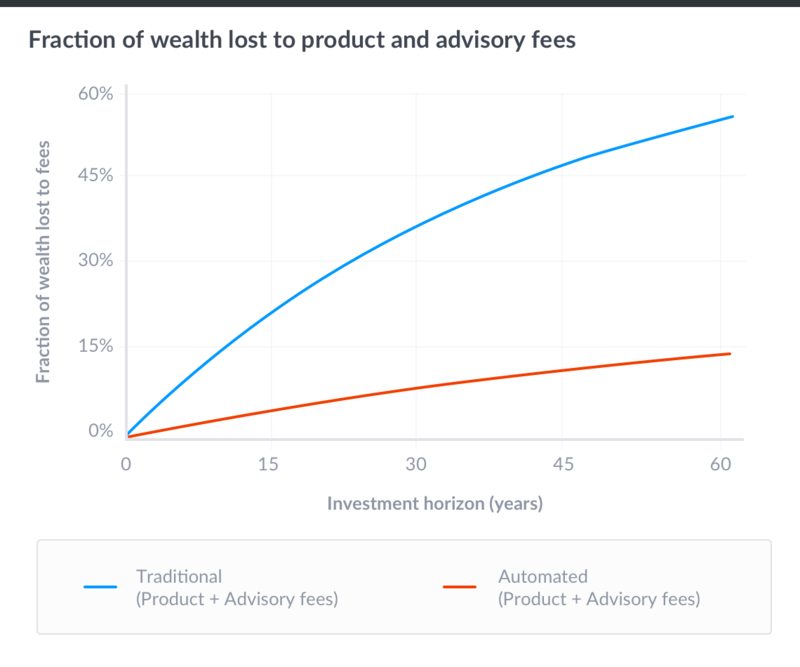 The low costs of index funds and automated advisors bring the total cost of the automated solution to 15% of initial wealth over a period of 60 years. By comparison, the total cost of the traditional solution, deployed using active funds, is a staggering 55% of initial wealth. Put differently, if you are 35 and expect to live until 95, a dollar invested today with a low-cost, automated investment advisor will generate a net-of-fee payoff almost twice as large as in the hands of a traditional manager. 2. We report data for mutual funds rather than ETFs, as mutual funds accounted for almost 8x as much assets under management as ETFs ($15.6 trillion vs $2.1T; ICI Fact Book 2016). The purpose of this blog is to illustrate the effect of compounding fees over time. Nothing in this blog should be construed as tax advice, a solicitation or offer, or recommendation, to buy or sell any security. This blog is not intended as investment advice, and Wealthfront does not represent in any manner that the circumstances described herein will result in any particular outcome. Investment advisory services are only provided to investors who become Wealthfront clients. For more information please www.wealthfront.com or see our Full Disclosure. Jakub Jurek is Wealthfront’s VP of Research. Jakub's research expertise spans theoretical and empirical asset pricing, and includes topics related to portfolio management, alternative investments, credit risk, market microstructure, as well as, currencies. His work has been published in peer-reviewed journals including the Journal of Finance, the Journal of Financial Economics, and the American Economic Review. Jakub has held academic appointments at the Bendheim Center of Finance at Princeton University, and The Wharton School at the University of Pennsylvania. Jakub holds an undergraduate degree in Applied Mathematics and a Ph.D. in Business Economics, both from Harvard University. Prior to entering graduate school, he worked in the quantitative equity strategy groups at Goldman Sachs and AQR Capital Management, LLC. He has also served as a consultant to Grantham, Mayo, van Otterloo, LLC, and the Harvard Management Company.